In the Cruise Vessel Terminal a boy with sailor‘s cap is waving to arriving and departing ships. A dog is hauling him back to the city. A bronze sculpture of 1,6 meter height, titled „Childhood dream“ is affixed on a 1,4 meter-high stone. 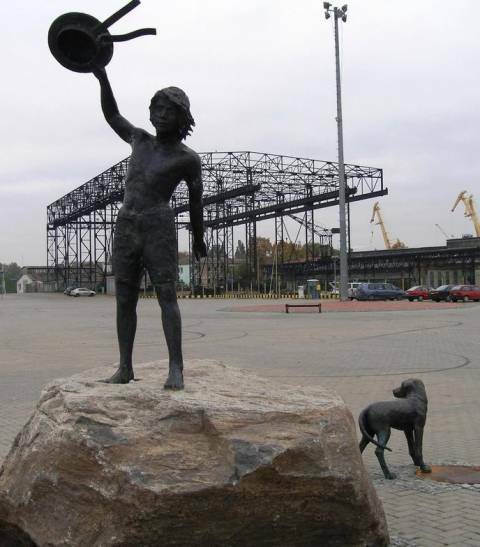 The authors – sculptor Svajūnas Jurkus, architect Vytautas Paulionis.“Klaipėda has image of youthful city, taking pleasure in jazz, and we wanted to express it in this sculpture“ – said author and sponsor of the idea, Director of UAB “Pamario restauratorius” A. Kliukas. (According to V. Grigas article „A bronze boy will be waving to ships“. Klaipėda, 2007 June 23). Skulptūra „Vaikystės svajonė“ / Tekstą skaitė Agnė Jonkutė, 2018 m.